The “Stinger” shoulder-fired surface-to-air missile has its place in history as being the CIA’s way of helping to defeat the Soviets in Afghanistan. Today, upgraded versions remain in wide use with US forces. So how do you train to shoot down an aircraft with a Stinger? By using intense virtual reality and by blasting real stuff out of the sky, that’s how. The FIM-92 Stinger Man Portable Air Defense System (MANPADS) was developed over nearly a decade as a replacement for the FIM-43 Redeye, America’s first MANPADS. It was finally put into initial production in 1978. Just a decade later, a whopping 16,000 Stingers had been built. The system was seen as so capable in the 1980's that when the refit Iowa Class Battleships were put back into service, Stingers were provided for point air defense as a cost saving measure instead of equipping the massive surface combatants with Sea Sparrow missiles. Over the years the Stinger has been upgraded as technology became more advanced, with countermeasure resistant dual mode seekers (IR and UV) being added. This updated technology allows the Stinger to home in on the UV picture of the aircraft as well as the aircraft’s heat signature, making it much harder to confuse the missile using decoy flares than if it were to have just an infrared seeker alone. Other updates, including the ability to reprogram the missile’s memory, an infrared/low-light sighting system and a proximity fuse on the missile’s warhead have also been added. These enhancements, along with many other smaller ones, gave the decades old design relevant capability against threats like small, low-heat emitting flying vehicles, namely UAVs, as well as the ability to more reliably lock onto targets that are flying among background clutter like steep terrain. Stinger launchers can be equipped with an identification friend or foe (IFF) system which is the large cage-like antenna on the top right of the missile launcher. If the missile is pointed at a friendly aircraft, the launcher will give the operator a specific tone to alert them. Although this system is popular with many Stinger customers, the missile can be used without the IFF system as well. The Stinger has served with 30 American allies, it carries a six and a half pound warhead, it has a minimum range of just 660 feet and the latest versions can reach up to over 20,000 feet. In actual use, long-range engagements would usually occur below around 14,500 feet based on common target slant ranges. Using the Stinger in combat is relatively simple. Crews usually work in two man teams, one being a spotter with binoculars to help identify targets, the other donning the Stinger missile and launcher. These steps are used to engage targets: activate the missile, acquire a steady lock-on tone, uncage seeker, super-elevate the launcher, center aiming reticle, fire missile. The Stinger then becomes “fire and forget” as it requires no other guidance from its operator to prosecute its target. When it comes to instructing crews on how to do this physically, there are a few levels of available training. The first, and maybe the most exciting, is actually firing the missiles at live targets. Low altitude unmanned drones, which are akin to large Hobby-like remote controlled aircraft, are commonly used for this purpose. For simpler training where everything but the actual destruction of the target can also be trained for, the standard FIM-92 launcher can be loaded with a dummy missile. This is a much less expensive way to go about getting the basics of the system down, including pulling the launcher’s trigger. A third and newly emerging way to train to use MANPADs like the FIM-92 Stinger is by putting the soldier operating it into an immersive virtual environment. The Army has an elaborate virtual training system known as the Improved Moving Target Simulator (IMTS), more commonly known as the the Stinger Dome. This sci-fi like facility uses a massive dome screen with 84 projectors running imagery piped in from seven computers. Over 100 types of aircraft can be shown, including low-flying and small UAVs, and many different weather scenarios and locations can be modeled with stunning accuracy. Up to four soldiers can use the simulator and its wireless Stinger MANPADS simulators at any given time and each Army air defense specialist will get 72 hours in the simulator during their initial training. IMTS is a follow-on to the lower fidelity and bug plagues Joint Fires Multipurpose Dome, which lacked the high definition and reliability of the IMTS. The whole idea of the IMTS is that it allows for less expensive and more diverse training than what even firing real missiles can provide. During simulator sessions, instructors can really push a student’s ability to visually discriminate between friendly and enemy targets and to rapidly engage the enemy ones if need be, even ones that are going extremely fast or coming at them from odd angles. Additionally, since the system is so flexible, instructors can come up with scenarios that challenge a student’s unique deficiencies, or others that push experienced MANPADS operators to their max. The whole idea is to get students way more comfortable with using the Stinger system than they would be relying on physical training alone. According to DefenseSystems.com, each Stinger costs about $120k. 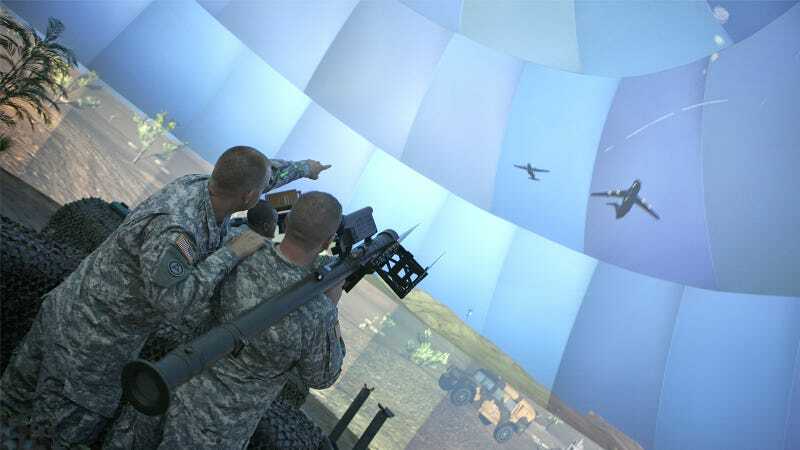 With this in mind, the Army says their giant dome simulator, versions of which are also in service with the USMC, saves at least $600k per student while also offering all the added benefits that high fidelity virtual simulation can provide. Other smaller and less expensive MANPADS simulators are on the market as well, many of which feature popular Russian MANPADS designs that can be found throughout the world. Still, the US military recognizes that nothing can compare to going out in the field and actually pulling the trigger on the real deal, which clearly remains a fan favorite among units that are equipped with Stingers. The Stinger is really due for an overhaul or outright replacement. One was underway in the late 90s before being cancelled in 2002 due to budgetary issues. The seeker system that was state-of-the-art 25 years ago is now outclassed by modern Imaging Infrared seekers like those found on the AIM-9X Sidewinder. Additionally, the system’s clunky batteries and dated memory banks are archaic by modern standards. Still, great training can overcome some of these deficiencies, and virtual reality along with good old fashion live-fire drills, give US Stinger wielding soldiers an edge they very well may need in actual combat.